John Walter Kliewer was born 8 June 1869 in the German Mennonite community of Michalin, Russian Poland, the son of John P. and Aganetha (Foth) Kliewer. In 1874 his parents migrated from Poland to Kansas, USA with their entire family, locating about 10 miles (16 km) east of Newton, Kansas. He was married in 1902 to Emma Ruth of Halstead, Kansas. Three children were born to this union. Kliewer attended high school in Newton, and after graduation from the Halstead Seminary in 1890 taught for a few years. Later he attended Bethel College and Garrett Biblical Institute, where he received the Bachelor of Sacred Theology degree in 1901. In 1925 Garrett Biblical Institute and Bluffton College both conferred the honorary Doctor of Divinity degree upon him. As a young man Kliewer united with the Gnadenberg Mennonite Church (General Conference Mennonite). He served as pastor of the Mennonite Church in Wadsworth, Ohio, in 1901-1903, and the Berne Mennonite Church in 1903-1911. In 1911 Kliewer was called to the presidency of Bethel College and resigned in 1920. In 1925 he again became president of Bethel College and directed the administration of the college until 1932. His greatest contribution was made as president of Bethel College. His administration came in a period of transition of the college and so was difficult and stormy, but the school made great progress under his leadership. Kliewer was a great conference leader. For a number of years he served on the Board of Trustees of Bluffton College. He was elected to the Home Mission Committee of the Middle District Conference while serving the Wadsworth Church and later became president of the Middle District Conference. He served as secretary of the General Conference in 1905-1908. In 1908-1935 he served on the Foreign Mission Board, and was sent to the Orient to visit the Mennonite mission fields in China and India. On this tour he also visited Mennonite churches in Europe. Upon his return he spent one year in visiting and reporting to Conference congregations. He also served on the Peace Committee of the General Conference during World War I. 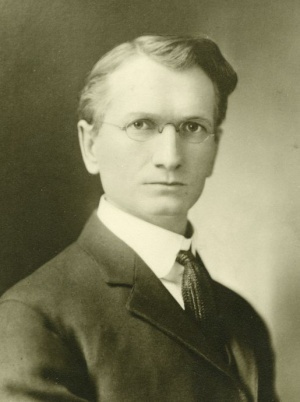 On 16 October 1932, Kliewer suffered a stroke, but recovered sufficiently to keep up his preaching duties until after the death of his wife in 1935. His remaining years he spent in retirement in the Bethel Home for the Aged writing his Memoirs. On 9 February 1938, he died at Newton, Kansas. Kliewer was the author of two books: Letters of a World Tour (Bethel College, 1936) and Memoirs of J. W. Kliewer (Bethel College, 1943). Kliewer, Johann W. Memoirs of J. W. Kliewer. North Newton, KS: Bethel College, 1943. Sprunger, Eva. The First Hundred Years. Berne, IN, 1938. Warkentin, A. Who's Who Among the Mennonites. 1937. Wedel, P. J. The Story of Bethel College. Newton, KS: Bethel College, 1954. Kaufman, Edmund G. "Kliewer, John Walter (1869-1938)." Global Anabaptist Mennonite Encyclopedia Online. 1953. Web. 23 Apr 2019. http://gameo.org/index.php?title=Kliewer,_John_Walter_(1869-1938)&oldid=162995. Kaufman, Edmund G. (1953). Kliewer, John Walter (1869-1938). Global Anabaptist Mennonite Encyclopedia Online. Retrieved 23 April 2019, from http://gameo.org/index.php?title=Kliewer,_John_Walter_(1869-1938)&oldid=162995. Adapted by permission of Herald Press, Harrisonburg, Virginia, from Mennonite Encyclopedia, Vol. 3, pp. 204-205. All rights reserved. This page was last modified on 13 January 2019, at 18:11.